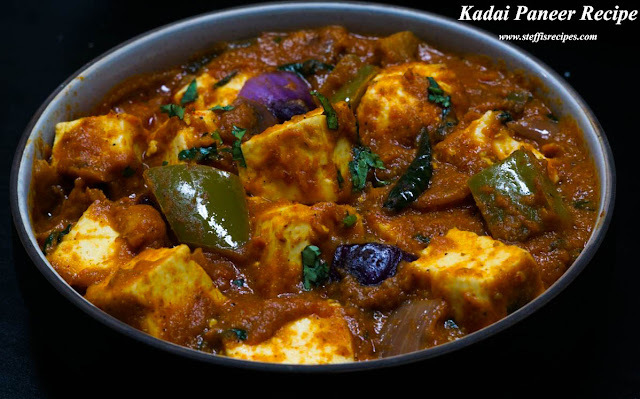 Kadai Paneer is a super easy and quick recipe which is often served as a side for naan, Chapathi and roti, it also goes excellent with rice varieties. This is a delicious recipe loaded with loads of flavor and taste , it has a silky curry base in which soft panner is added which melts in your mouth. This kadai paneer is made with freshly ground Kadai masala which makes this recipe sound very similar to restaurant style Kadai paneer and also adds nice aromatic appetizing smell to the recipe . We can use this masala for making Kadai Chicken and Mushroom just replace the paneer with mushrooms to make awesome kadai Mushroom recipe. Heat oil in a pan and add onions, little bit of salt and saute it for few minutes. Once the onions turns golden add Garlic, Ginger, Turmeric powder, chili powder , tomatoes and add required water and let it cook for 5- 6 minutes. Once the tomatoes are nice and soft transfer to a blender and once the mixture cools down grind it to a smooth paste. Heat oil and once it is nice and hot add the whole spices - cinnamon stick, cardamom, cloves and then add green chilies ,cubed bell pepper and onions. Once the tomatoes turns translucent add the freshly ground kadai masala from step 1 and mix well. Then add the onion tomato base from step 3 and mix well.Also add required water and salt. Cover and cook for some more time. Finally add the cubed paneer and mix it gently with the masala base and cover and cook for another 2 - 3 minutes. That's it our delicious Kadai Paneer is ready under 20 minutes and is ready to be served hot with roti, chapathi or any dish of your choice. It is really quite simple easy to make and tatses absolutely delicious. You can roast / fry the paneer in some ghee for a couple of minutes and add it to the curry to enhance the taste of Kadai paneer Recipe. Please do try the recipe and share your feedback. Happy Cooking and " Spread the JOY of COOKING " . Kadai paneer is an awesome flavorful recipe made with freshly ground kadai masala, in which paneer is added to a rich creamy curry base which is an excellent companion for rice, roti and chapathi. Our Kadi Paneer / Paneer masala is ready to be served.